Et rigtig godt produkt til prisen!! Kraftig LED lampe i robust og kompakt lampehus. Kan erstatte traditionelle par lamper. Utrolig koncentreret stråle, der i kraft af 3-i-1 dioderne kun laver meget lidt RGB skygger. kraftig - og tilmed til favorabel pris. Absolut den kraftigste LED lampe vi har i dette prisleje. Kan nu erstatte de gængse par lamper med par pærer. 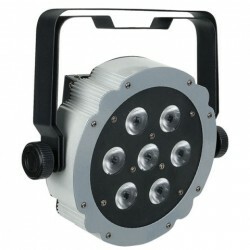 The Compact Par 7 Tri is an unique designed and compact but powerful parcan fixture. It offers full 3-in-1 RGB color-mixing ensuring vivid colors with a perfect color-mix. Due to its compact design it saves a lot of space for transportation and also in use. 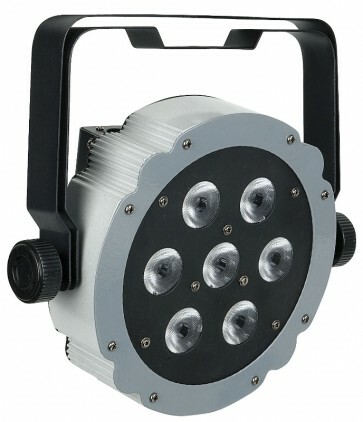 The Compact Par 7 has full digital addressing and offers both DMX control and sound to light function. For small applications the Compact Par 7 Tri has also a Master Slave modus.